[11:31] brad_the_carter: and she sounds american. so it’s not a language barrier. she actually thinks Dr. on the end of an address stands for Doctor. [11:32] Brad: so i had her spell out the address for me. and she spelled D R. and i said “i thought you said it was doctor on the end.” and she says no, it’s just the abbreviation for doctor. [11:33] Brad: so i clued her in that dr. meant drive. and she says “oh!” and does a stupid laugh. My ripping is out of control. I’ve got DVDs ripping on my laptop and cassette tapes ripping on the big computer. Right now I’m ripping the Electric Dreams movie soundtrack. 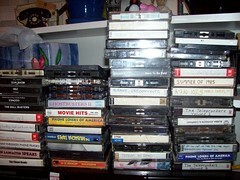 I’ve only got about 5 real audio music cassette tapes that I never converted to CD or mp3. Then I’ve got about 20 audio cassettes of various prank call groups, given to me in trade back in the days before everyone owned CD burners. 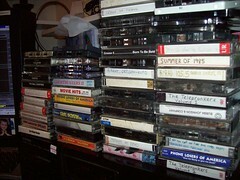 And then a few dozen of my old mix tapes with things on them that its unlikely I’d ever find them on bittorrent. Plus a few tapes of friends and I doing wacky things. Today I bought a dual cassette deck from Goodwill for $20. If I get all my ripping done within the 15 day return period, I can return it for store credit. I guess it would have made more sense to buy a $100 cassette deck from Target and just return it after 30 days for cash. I’m sure I can get these all ripped within a week, though. Then I can finally throw away the rest of my cassettes. Sure it wouldn’t be quicker and easier just to download all that stuff? Tachyon doesn’t appreciate analog. He’s mean.